A very elegant ladies' dress cane suitable for light support and balance. 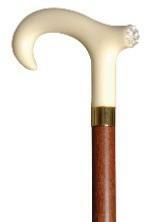 The imitation ivory 'crutch'-shaped handle offers excellent support and comfort to the smaller hand. The end face of the handle (the part most visible when the cane is held in the hand for walking) is set with Swarovski Elements and fine, yellow metal embellishments, for a pretty, sparkling effect. The mid-brown hardwood shaft is fitted with a smart brass collar at the neck of the cane and a discreet non-slip black rubber ferrule on the tip. Ferrule diameter 19mm.